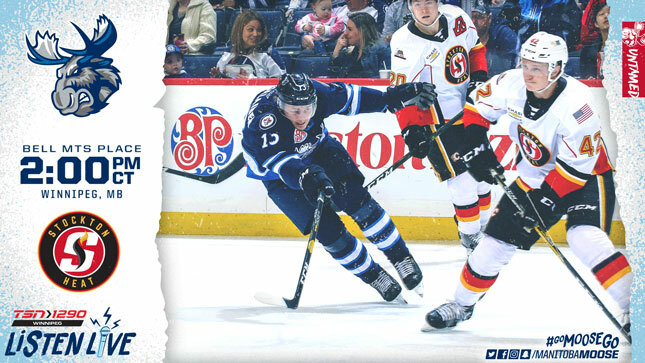 The Manitoba Moose (37-28-5-2) are fighting for a spot in the playoffs in today’s rematch with the Stockton Heat (29-29-4-2) at Bell MTS Place. It’s the final home game of the regular season for the Moose which means it’s also Fan Appreciation Day. Today’s action will be punctuated with hundreds of prizes, giveaways and more. Puck drop is at 2 p.m. CT with limited tickets still available at moosehockey.com/tickets. Manitoba enters today’s game sitting in fourth place in the Central Division and will make up their game-in-hand on the rest of the teams in the race for the final two Central playoff spots Sunday. With a win, the Moose will move into third place in the division as well as set a new franchise record for home wins in a season. 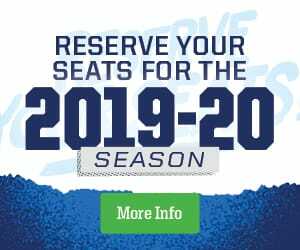 Manitoba is 25-10-1-1 at Bell MTS Place in 2018-19. The goaltenders stole the show in Saturday’s meeting. Stockton’s Jon Gillies made 30 saves in the loss while Manitoba’s Mikhail Berdin stopped 26 for his second career AHL shutout. Ryan White, who led the Moose in shots on Saturday, spoke about how the team draws energy from their talented netminder. Today’s game will be Berdin’s eighth consecutive start with a 5-1-1 record and a 0.942 save percentage through those games. Mason Appleton recorded the lone goal, his seventh game-winner of the season. With 13 career game-winning goals in just 112 games, Appleton sits sixth all-time for Manitoba. With 36 career AHL goals, 36 per cent of second-year pro’s tallies are game-deciding. The Moose are very familiar with close games. 10 of the team’s last 13 contests were decided by the slimmest of margins. In those 10 games, Manitoba is 7-1-2-0. Overall this season, the Moose are 22-7-5-2 in one-goal games. The Moose have shown an ability to shut down games in the third period throughout the campaign. After yesterday’s win over the Heat, Manitoba are 29-3-3-2 when leading after two periods. White said the team’s focus on details from start-to-finish will need be strong again today if the Moose are going to sweep Stockton. Today’s game will be broadcast on TSN 1290, moosehockey.com/listenlive/, the Moose App, and streamed live on AHLTV. Manitoba wraps up the season on the road with three games against the Griffins and Wolves next weekend starting Friday night in Grand Rapids.